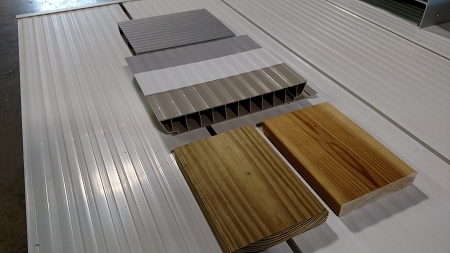 If you are ready to move forward with your project but cant decide on the decking surface this may help! For the UPS cost only we will ship you cutoffs of all of our decking surfaces. This includes anodized aluminum, 3 colors of vinyl, stained cedar, and treated pine. The dock samples were very helpful to me. First, unlike the website pictures, my deck samples were installed on short side runners. This allowed me to see the differences in the runners used with Vinyl decking and the other deck surfaces which are all not as deep as the the vinyl. It also let me see the difference between the pine and cedar. My wife liked the look of the cedar. I also set the sample dock sections out in the sun. That allowed me to get a feel for how they felt on bare feet after sitting in the hot sun. Finally after looking at the pictures on line I did not understand why the shipping cost was so high.....After receiving the package I understood. These are dock samples. 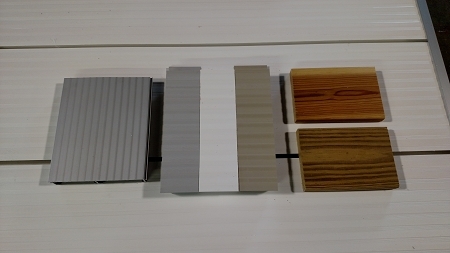 Not just deck surface samples. Received samples which were adequate for me to test how slippery & hot they might be during use. Materials were all high quality and they will be in my final plans.